Copies are in stock & ship within 24 hrs! "A tour de force. Exquisitely rendered." ​"A novel in conversation with Faulkner & Melville. Bold & ambitious." ​can have on every one of us." 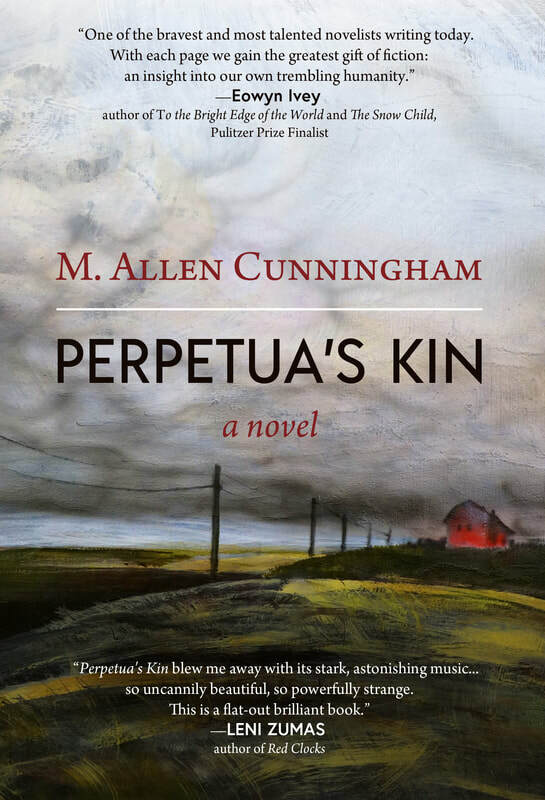 Perpetua's Kin is M. Allen Cunningham's enthralling multi-generational mystery, reworking of Hamlet, and profoundly contemporary exploration of the American experience as one family embodies it. Spanning much of North America over more than a century, from the 1820s Midwest, through the American south of the Civil War, to the remote west of the 1880s, and finally to World War II San Francisco, Cunningham's novel is a powerful portrait of this nation's violent heritage, our vulnerability to the vastness of our own geography, our chronic restlessness and desire for regeneration through technology, and our inability to escape the history that forms us and, always, demands a reckoning. Listen to "Perpetua's Kin: The Harvest Taught Him" on Spreaker. "Perpetua's Kin blew me away with its stark, astonishing music. I've never seen the raw devastations of war brought alive in language so uncannily beautiful, so powerfully strange. This is a flat-out brilliant book." and the vast American landscape that breeds both." steered by a master storyteller." author of The Hidden Letters of Velta B.
this narrative's power is irresistible." and a joy to read." electrical energy that somehow tell a tale..."
​novelists can have on every one of us." ​unclasp its grip on you." "I very much hope [Perpetua's Kin] reaches as many readers' hands as possible...expansive in scope and ideas...precise and tight in language. For me, over the course of three days, it cut through the bells and whistles constantly demanding our attention and let me sink into its enchanting world." and motivations. Are we condemned to repeat the past? "A poetic, kaleidoscopic look at inter-generational pain, love, longing, and restlessness, through the lenses of war and telegraphy." An excerpt from Perpetua's Kin was published in Catamaran, Fall 2013. On the basis of his work in Perpetua’s Kin, M. Allen Cunningham received a 2018 Project Grant from the Regional Arts & Culture Council, an Oregon Literary Fellowship from Literary Arts, an Individual Artist Fellowship from the Oregon Arts Commission, a Yaddo residency, and was awarded Honorable Mention in the Glimmer Train Family Matters competition. M. Allen Cunningham's debut novel The Green Age of Asher Witherow (Unbridled Books, 2004) was named a #1 Indie Next Pick by the American Booksellers Association, was a Finalist for the Indie Next Book of the Year Award alongside works by Marilynne Robinson, Philip Roth, and Joyce Carol Oates, and was dubbed a "Regional Classic" by the Mountains & Plains Booksellers Association and one of six "Best Books of the West" in the Salt Lake Tribune. Cunningham's Lost Son (Unbridled Books, 2007), an experimental biographical novel about the life and work of Rainer Maria Rilke, was named a Top Ten Book of the Northwest by The Oregonian and added to the official Rilke bibliography in Europe. His 2015 samizdat novel Partisans ​was a Finalist for the Flann O'Brien Award for Innovative Fiction and was praised by the late great Booker Prize winner John Berger, who said "It gave me energy...we join forces." Cunningham is also author of the illustrated, limited-edition short story collection Date of Disappearance and two volumes of nonfiction: The Honorable Obscurity Handbook and The Flickering Page: The Reading Experience in Digital Times. His work has appeared in The Kenyon Review, Tin House, Glimmer Train, Alaska Quarterly Review, Lit Hub, Catamaran, Poets & Writers, ​and many other outlets. He is the recipient of numerous fellowships and awards, including an Oregon Literary Fellowship, a RACC grant, two fellowships from the Oregon Arts Commission, and residencies at Yaddo. Cunningham holds an MFA from Cedar Crest College's Pan-European Program in Creative Writing and is an Adjunct Assistant Professor of English at Portland State University. He started writing Perpetua's Kin ​in 2007.